My Dream is and has always been to find sponsors who are able to purchase my CDs and then gift them to those going through stressful life circumstances. To help make this possible, we've reduced the cost of each CD and packaged them so each sponsor can add their personalized marketing label to the back panel. The sponsor can then share this inspired music as a compassionate gift to help bring peace, comfort and healing to those in need. Sponsor and share the CDs listed below with patients, clients, staff, volunteers, friends, family and loved ones. See Below for a sample listing of organizations that have sponsored and shared this music with others. This inspired music calms the mind, relaxes the body and relieves pain, stress, and trauma held within soul. These beautiful melodies create a blanket of sound that wraps you gently in compassion, allowing you to remember love and experience inner peace. 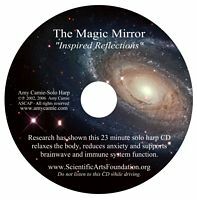 Research with this 23 minute CD indicates it has a direct positive impact on brainwaves disrupted by stress and trauma. After listening to this CD once a day for 10 days it increased neurological functioning (as measuring by Quantitative EEG) in 5 women undergoing chemotherapy treatment for cancer. Saliva sample studies also indicated that this music had a sustained impact on immune system biomarkers for up to 72 hours after listening to it once. The 13 tracks on this original 62 min. 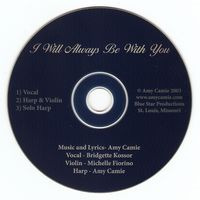 solo harp CD are feelings...no words...no titles...just expressions from a Space Within. As you listen, let yourself imagine...play like a child. If thoughts and ideas come to you, express them...create your own titles...write your own words...draw your own pictures...dance your own dance...it's all a beautiful expression of your connection to your Space Within. Inspired by my children and written for the child in all of us after September 11, 2001,this gentle lullaby reminds us that we are never alone.Perfect to share with anyone who feels separated from someone they love. Back Label is available for you to create your own message. of how this music has touched the hearts of people around the world. Numerous Friends, Family and Individuals have sponsored CDs to be gifted to others - In celebration of my last chemotherapy treatment, 86 CDs were gifted to The St. Louis Cancer and Breast Institute and 215 CDs were gifted to several local organizations in celebration of my last radiation treatment.